317 foot Vernal Fall is one of the many powerful waterfalls within Yosemite National Park, not visible from the main valley but easily reached along a well-marked path that begins near the Happy Isles Nature Center - this in turn is half a mile from the end of the publicly drivable road and is served by a free shuttlebus. The path (the John Muir Trail, aka Mist Trail) is level at first although sandy and rocky, and is often quite crowded. 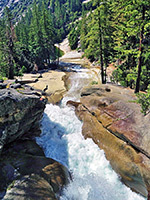 It winds through wooded land just north of the Merced River, at this point a fast-flowing, boulder-filled whitewater torrent with many small rapids and cascades. The view looking back towards Yosemite Valley gets more dramatic as the path gradually ascends, turning due east as it rounds Sierra Point, below 8,222 foot Grizzly Peak. Vernal and Nevada Falls topographic map. The footpath crosses the Merced on a wooden bridge, location of a (seasonal) supply of drinking water, then continues upstream on the south side, becoming gradually steeper. Not far beyond the bridge is a junction; the John Muir Trail forks off to the right and switchbacks steeply up the side of the valley while the left branch remains at river level, approaching the falls after another half mile. This path is known as the Mist Trail since the whole area just below the fall is continually dampened by spray, hence the rocks are covered with moss and other water-loving plants, and some parts of the trail become quite slippery. If the sun shines, transient mini rainbows form, and change shape as the spray is wafted in the breeze. By late summer though the amount of water is much reduced and the path less misty. Many steep steps take the trail up the rock face beside the waterfall, after which the path emerges onto a large, flat, open area at the top, with a railing-protected viewpoint right at the edge of the surging water. 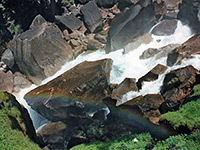 Just upstream is a large tranquil pond (Emerald Pool), and an unusual cascade known as the Silver Apron, where the waters flow down a smooth, 30° slope of polished granite, dropping about 50 feet. 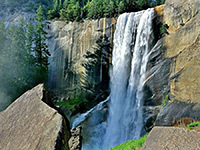 These alluring features are one of the reasons why Vernal Fall is the most dangerous waterfall in Yosemite, with around 13 people known to have died (since 1924) after being swept over the edge by the strong currents, as a result of swimming, wading, boulderhopping or slipping from the riverbank. This is despite many warning notices in multiple languages advising of the dangerous conditions. 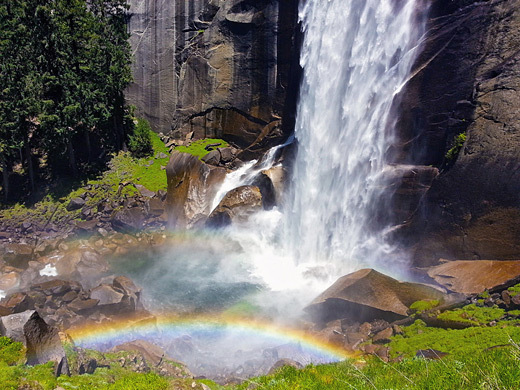 The total elevation gain along the 1.5 mile walk to Vernal Fall is 1,000 feet. 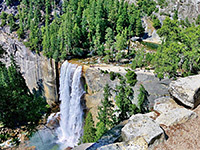 The Mist Trail continues to the even more spectacular Nevada Fall, 2 miles further east. A second route to Vernal for horses only leaves Happy Isles and passes along the south side of the Merced River, joining the main footpath soon after the bridge. Also just after the bridge, the John Muir Trail provides another way to reach Nevada Fall then continues up the Merced valley, and later along that of its tributary Sunrise Creek before climbing into the high Sierra to the Tuolumne Meadows visitor center, a total length of 20 miles (see hiking guides for Yosemite Valley and the Tioga Road). 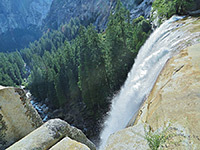 High above the Merced River, the Panorama Trail gives alternative views over both Vernal and Nevada falls, as well as Yosemite Valley and many surrounding mountains.